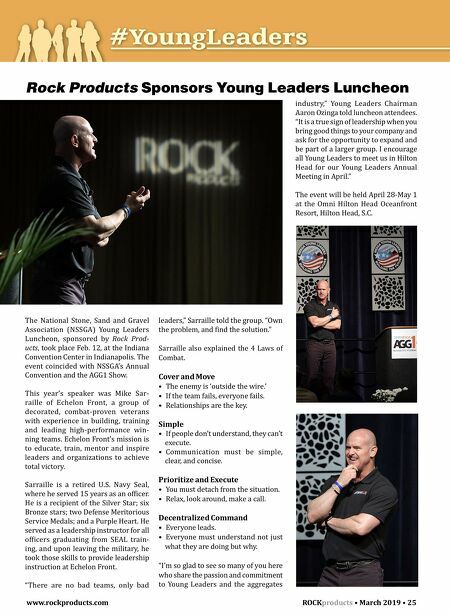 www.rockproducts.com ROCK products • March 2019 • 25 The National Stone, Sand and Gravel Association (NSSGA) Young Leaders Luncheon, sponsored by Rock Prod- ucts, took place Feb. 12, at the Indiana Convention Center in Indianapolis. 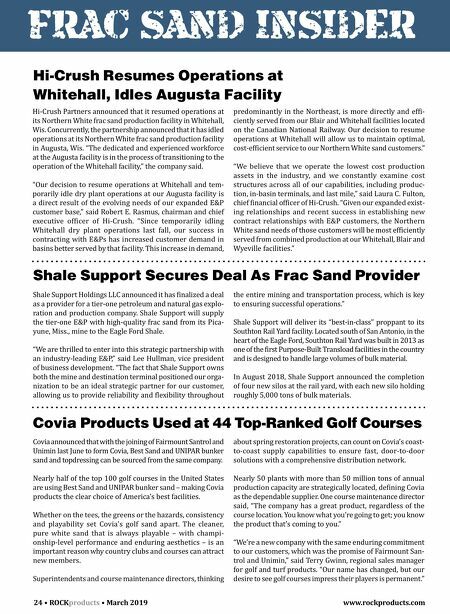 The event coincided with NSSGA's Annual Convention and the AGG1 Show. This year's speaker was Mike Sar- raille of Echelon Front, a group of decorated, combat-proven veterans with experience in building, training and leading high-performance win- ning teams. Echelon Front's mission is to educate, train, mentor and inspire leaders and organizations to achieve total victory. Sarraille is a retired U.S. Navy Seal, where he served 15 years as an officer. He is a recipient of the Silver Star; six Bronze stars; two Defense Meritorious Service Medals; and a Purple Heart. He served as a leadership instructor for all officers graduating from SEAL train- ing, and upon leaving the military, he took those skills to provide leadership instruction at Echelon Front. "There are no bad teams, only bad leaders," Sarraille told the group. "Own the problem, and find the solution." Sarraille also explained the 4 Laws of Combat. Cover and Move • The enemy is 'outside the wire.' • If the team fails, everyone fails. • Relationships are the key. Simple • If people don't understand, they can't execute. • Communication must be simple, clear, and concise. Prioritize and Execute • You must detach from the situation. • Relax, look around, make a call. Decentralized Command • Everyone leads. • Everyone must understand not just what they are doing but why. "I'm so glad to see so many of you here who share the passion and commitment to Young Leaders and the aggregates Rock Products Sponsors Young Leaders Luncheon industry," Young Leaders Chairman Aaron Ozinga told luncheon attendees. "It is a true sign of leadership when you bring good things to your company and ask for the opportunity to expand and be part of a larger group. I encourage all Young Leaders to meet us in Hilton Head for our Young Leaders Annual Meeting in April." The event will be held April 28-May 1 at the Omni Hilton Head Oceanfront Resort, Hilton Head, S.C.